What Time Is the Zero-Gravity Super Bowl? Football and jetpacks have a long history together. But what if you actually strapped the jetpacks on the players? That was the idea in this illustration from a 1981 kids’ book that promised “zero-gravity” football played in space colonies of the future. Back in the 1970s and ‘80s there was a sense that as soon as space travel became commonplace, all our favorite pastimes would have to adapt. The most pressing question for kids of the time wasn’t whether they’d get to space or not. It was how would we have the most fun playing the games we love in zero-gravity. What are sports going to be like in the future?Will people thrill to the sight of othersexerting themselves to the utmost, or willcomputers take over? The answer is probablythat both things will happen. It’s very likelythat people will always want to gather atsports stadiums to watch their home teams inaction. But computers may also excite uswith amazing new kinds of sports. The electronic computer games we playnow could become popular spectator sportsin the future. They would not be seen ontelevision screens but in midair! Using thetechniques of holography, a way of producing three-dimensional images that can floatabove the ground, the games could take placein vast arenas or stadiums before manythousands of people. Imagine a Space Invaders tournament of the future. Teams ofplayers sit in the arena, handling the controlsof the computers and lasers which generatethe holographic images. With a blast of musicor roar of sound, ranks of spaceships belonging to one team appear to dive toward thestadium. The other team’s ships take off andbattle with the invaders high above theaudience. The game is played at incrediblespeed, calling for split-second decisions bythe players. It provides thrills galore. Another apparently superhuman sport willbe played by people themselves in the future.Out in space colonies or space stations, therewill be zero-gravity zones where everything isweightless. Everyone there will float throughthe air, just as astronauts do in space.Imagine a weightless kind of football in threedimensions, with six fields, or pitches,marked out by laser lines in the shape of acube. Inside, the players zoom in all directions, using tiny portable compressed-airmotors to propel themselves after the ball.There are six goal areas, one in the middle ofeach field! However, one thing is the same asfootball now — collisions are just as painful! We’re still quite a ways from playing the space sports of tomorrow. 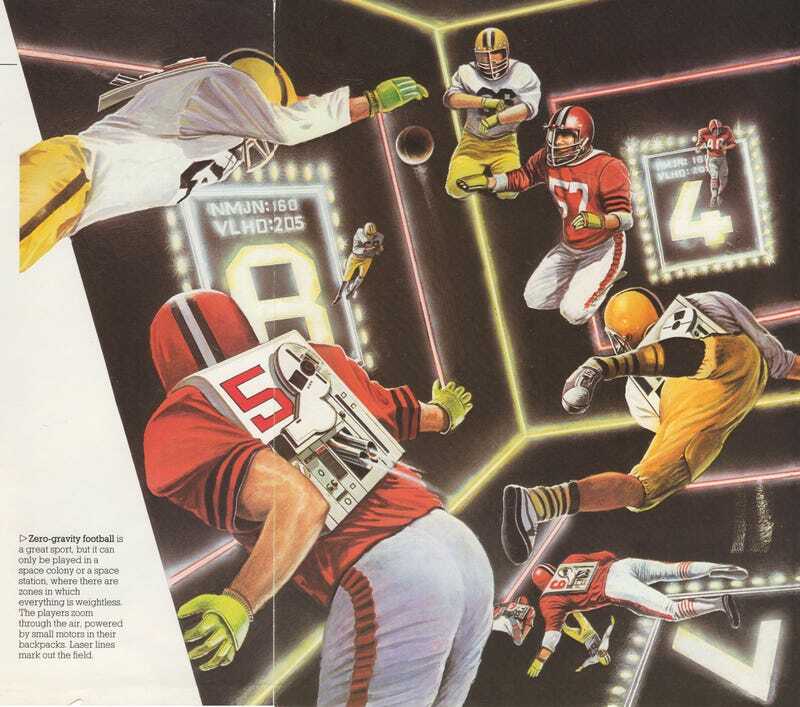 And further still from zero-gravity football. One imagines that the NFL has enough to do putting house in order here on Earth before it starts seeing concussions on the final frontier.